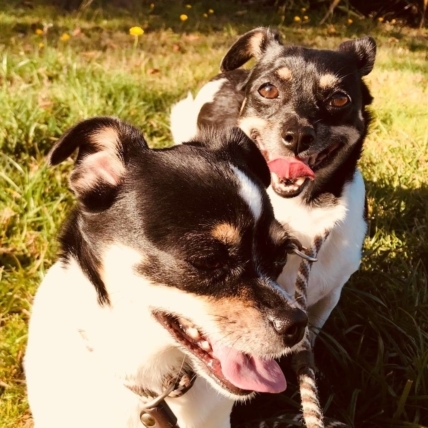 Rocco is our KMUN, DAILY ASTORIAN, 94.9 THE BRIDGE, WARRENTON KIA, HITS 94.3 KRKZ, and CLATSOP NEWS Pet of the Week for the week of March 31, 2019. Hayden is our KMUN, DAILY ASTORIAN, 94.9 THE BRIDGE, WARRENTON KIA, HITS 94.3 KRKZ, and CLATSOP NEWS Pet of the Week for the week of March 17. 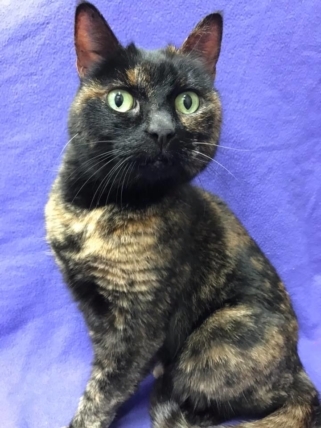 This sweet 11 year old tortie is patiently waiting for a forever home. She is a gentle and lovely lady who loves to carry on a conversation. She’s going to make a loyal companion and someone out there very happy! Come meet Sylvia anytime Tue.-Sat. 12-4 at the Clatsop County Animal Shelter. 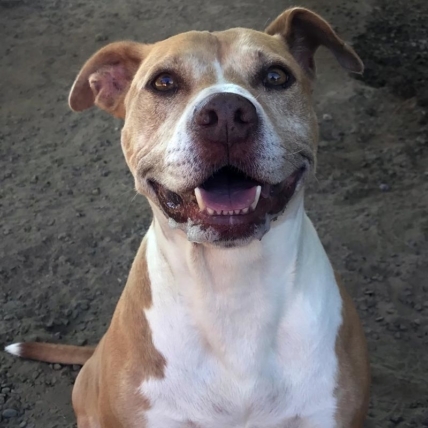 Meet Brandy, our loveable 8 year old female pit… With her strawberry blonde coat and golden eyes she is sure to win your heart! Brandy loves a long walk, knows how to sit, lay down and is excellent on a leash! She also has a serious mellow side while still being able to catch a treat out of mid-air! 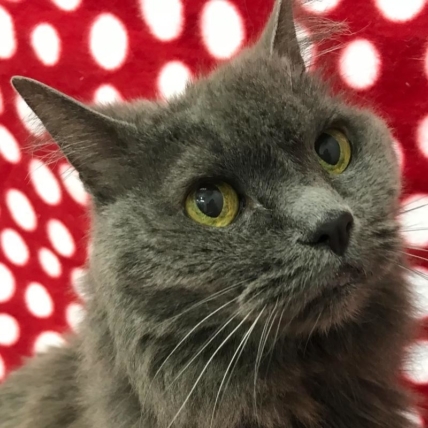 While Brandy would prefer to be an only pet, she will shower you with affection and cuddle with you during these cold, rainy days and nights. 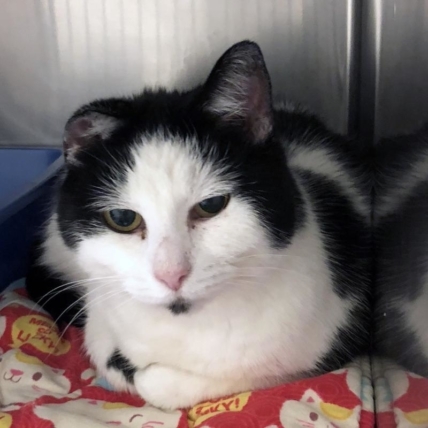 Mumu is a shy girl who is coming out of her shell at the shelter… and she is hoping for a wonderful new home in 2019! 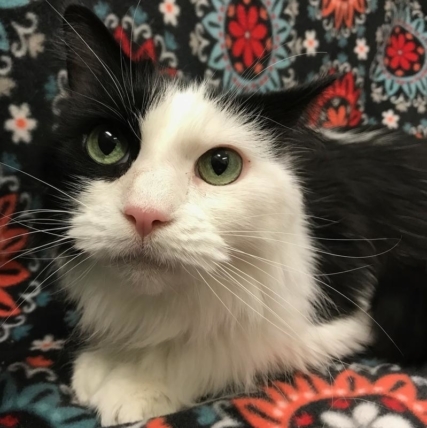 She is a mature lady at 12.5 years old, has a beautiful long black and white coat and captivating green eyes. Come see Mumu for yourself and decide if it is time to begin the New Year with the addition of a feline friend! 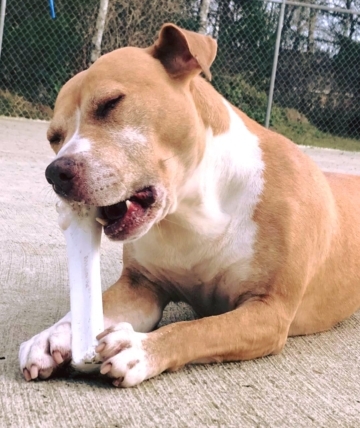 Bug is a 4 year old male tan/white pitbull. He’s a mellow guy who loves his walks. Bug broke his leg when he was younger and was not treated for his injury. He walks with a bit of a limp but that does not get him down….he’s a happy guy. Come meet him. 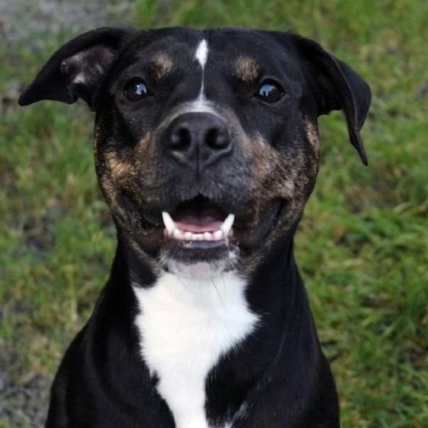 Sue tells us, “Penny is an energetic four year old lab/American Pit Bull Terrier mix. She’s a very quick learner and can sit, stay, lie down and does very well playing “find it!” She walks well on a leash and enjoys lolling around in the sunshine receiving belly rubs. 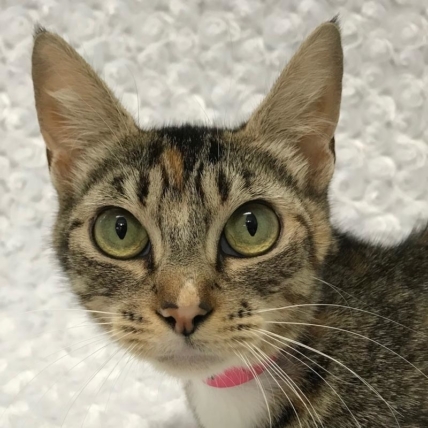 She almost hums or purrs – such a sweet girl! Penny would be delighted to join you for a walk on the beach, hike in the woods or ride in the truck. She is very particular about other dogs, preferring to be the only dog in your home.” But, as an only pet she’ll adore you. This young girl (she’s about a year and a half old) came to the shelter with a litter of kittens. She was an attentive mom to them until they were adopted out. Now it’s her turn. 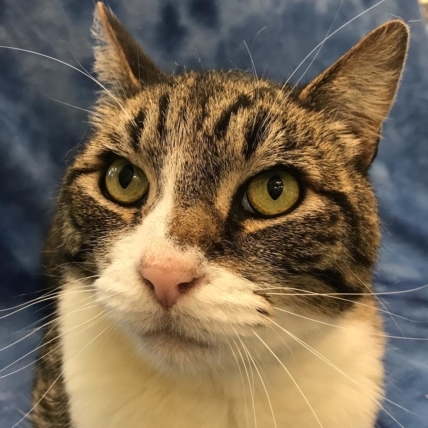 Our cat room volunteers tell us that Polly is a smart, sweet and quiet young lady who appreciates petting and would bond quickly with a new owner. The petite and elegant Giselle possesses a somewhat timid and loving personality. As she feels safe in your presence, the true quality of this lovely creature is exposed. Overusing the word `elegant` is too easy in describing Giselle as she simply is ELEGANT. 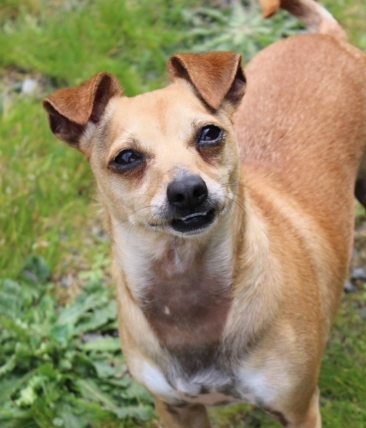 Giselle has a very gentle and loving quality and will become a devoted companion. Giselle is currently greeting customers at Petco. Brandy is an 8-year old distinguished bronze and white beauty. She is an American Pit Bull Terrier who is very friendly and engaging with people but would prefer to be the only pet in your home. 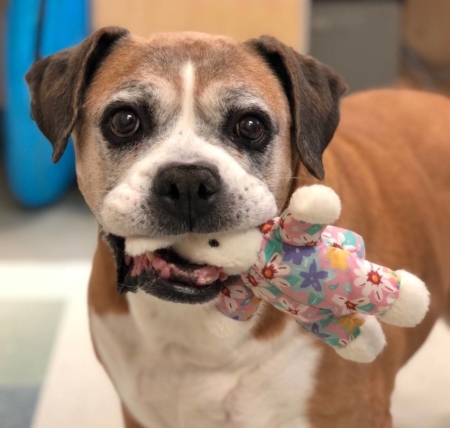 Brandy enjoys sauntering around the play yard then wandering through trails and grasses for a walk – she also happily enjoys snacks in exchange for sitting and laying down. Brandy has the sparkling golden eyes of a youthful dog eager to experience life. 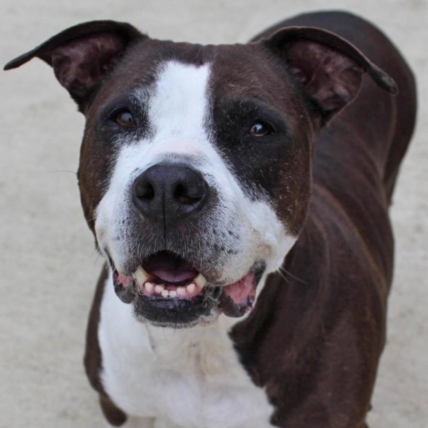 Lucky is an eleven year old female pit bull who came to the shelter because her owner could no longer care for her. 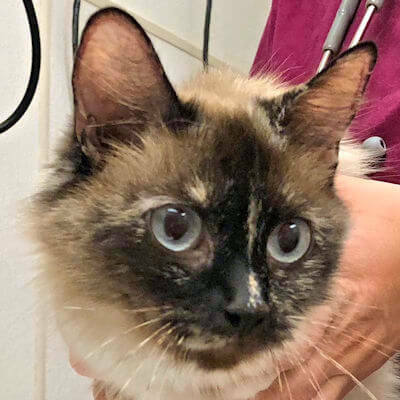 Lucky had some skin issues when she first came in; she patiently tolerated daily medicated baths and was an absolute doll in the car on several trips to a specialist in Portland. 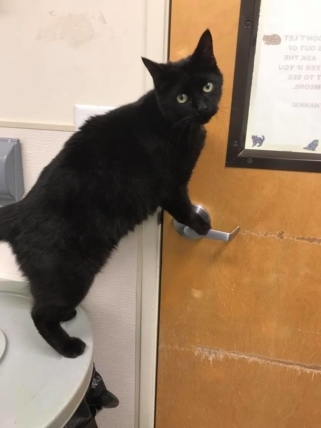 Lucky is a favorite with the volunteers and you may see her hanging out in the shelter manager’s office during the day. She will need a fully fenced yard. “A most beautiful mom to her two kittens, Jack and Jill. When we brought them home to foster the kittens were one week old. We made their warm cozy nest in the bathtub. Her space included all of the bathroom for food, water and litter box. We always left the door open. 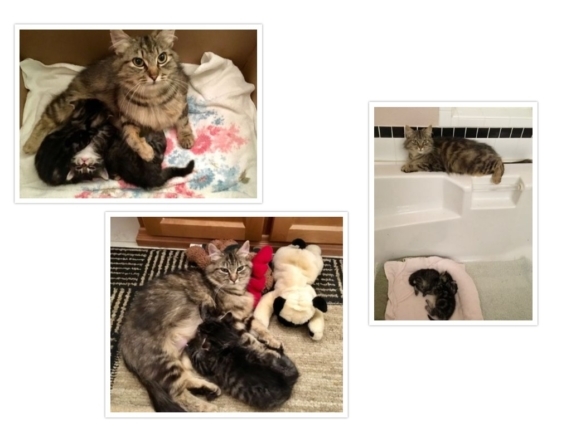 She never lost sight of her kittens for two weeks and never left the bathroom. She always greeted company to her space and let me play with her kittens. She finally let me brush her beautiful long silky hair. She rubbed against my legs and started (the purr). As the kittens grew we put a box on the floor for them and their mama. We had visitors who loved to come and help me (socialize the kittens). She watched warily from the back of the bathtub but eventually would come forward and let them admire her too. The kittens grew and ventured out of the bathroom into the rest of our apt. One day she followed them and decided it was a kind of neat space and started spending more time there. But now the kittens were eating more and more solid food and they had sharp little teeth. They were grown. The shelter was waiting for them for their adoptions soon. Mama Rosita had to return to return to the shelter too. She is still there. 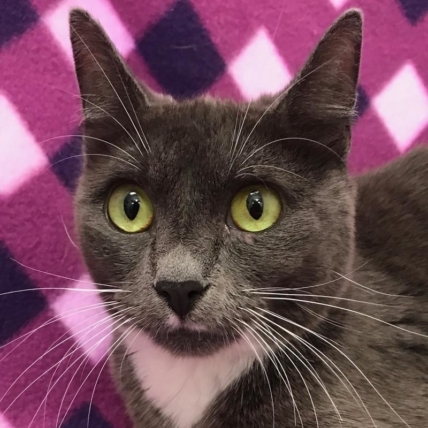 Our volunteers say that Belle is a grey beauty. She is tall, long, and greets you with a friendly hello. You have to meet her in person to fully understand because her personality is sweet. She is laid back, likes head scratches, and blinks her gold eyes at you. She`d make a great addition to any home. 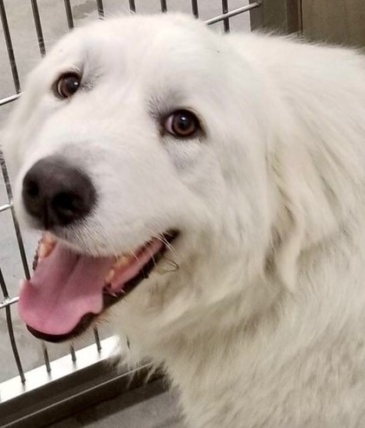 Adak is an almost 3 year old Great Pyrenees. Not only is he impressive in terms of beauty and size but he also has a very calming energy about him… And he has those thoughtful eyes to top it off! He is amazing on leash, likes long, mostly slow walks and seems to get along well with other dogs. Adak will need to be groomed routinely to maintain his thick coat and will also need to continue to put on weight to go forward as a happy healthy adult dog! A family with lots of love to give and fenced property (the more the better!!) for him to roam would be ideal! 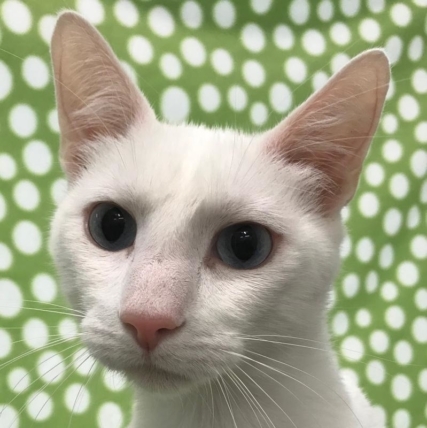 Gary is a stunning white cat with deep blue eyes and a serious expression. 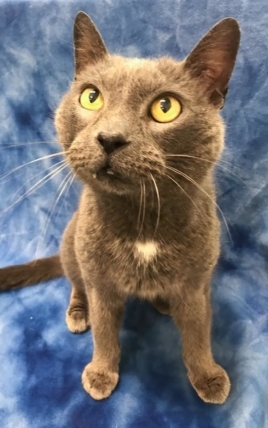 He is a soft-hearted cat, ever observant of his surroundings.” You can visit Gary this week at Warrenton Petco in our shelter adoption kennel. Ask the Petco staff if you’re not sure where the shelter kennels are. 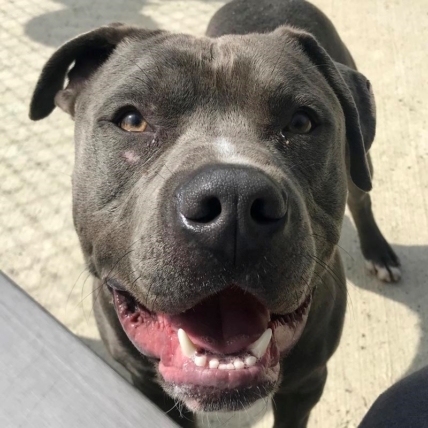 Roxy is a medium-sized two year old female pit bull with a gorgeous silvery coat complemented with a white chest badge. She is beginning to learn all of her basic training and is a quick learner. This happy girl came in because her owner couldn’t care for her anymore. 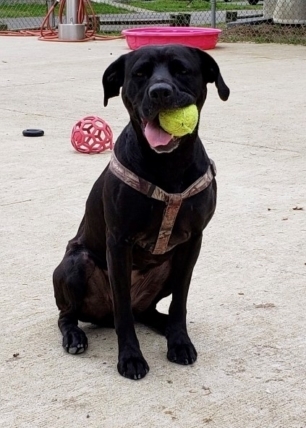 While she is not fond of cats and can be picky about which dogs she likes, she has lived with children and done well meeting children at the shelter. She loves her walks with the volunteers, the longer the better. Roxy will need a fenced yard. 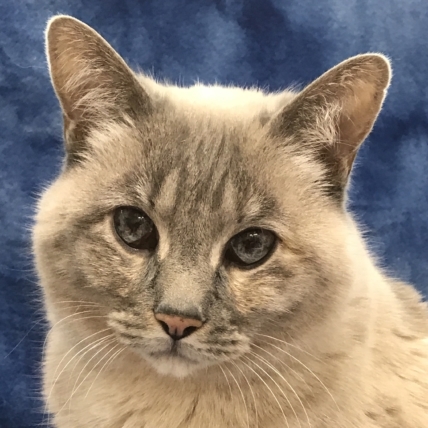 Holly is a very talky girl, which isn’t surprisingly since she is a Siamese mix. Terri, one of our cat volunteers, says “she growls and hisses at everything and nothing at all.” But she is all talk. Terri says Holly once jumped up in her lap and settled right in nice and cozy, while continuing to growl. Sounds like she just wants you to know she has a lot to say. spend a little one on one time with her. Sophie will be a great companion. Buddy was a star at the Mutts & Moms dog show and adoption event at the Inn at Cannon Beach Saturday. He met lots of adults, kids, and dogs, and greeted them all with a wagging tail. He loves his walks and is happy to snuggle on your lap once he’s back inside. He’ll be a terrific addition to any home. 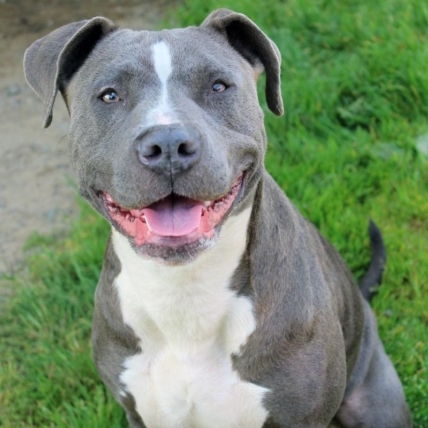 This eleven month old blue nose pit bull is a solid, well-rounded dog with a very friendly disposition. Everest wags his tail while on a walk, is great with kids and is a gentleman when offered a treat. He knows how to sit, warms up to new people quickly and is working on his leash skills. 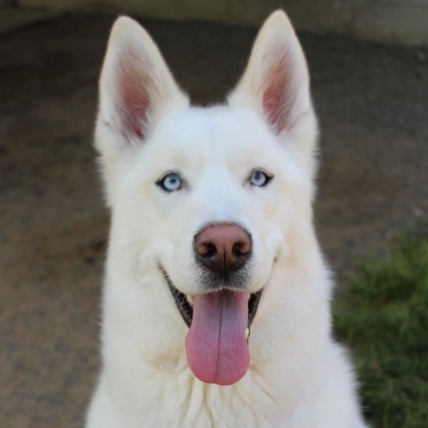 Everest would be a great candidate for more training, as he is young and eager to please. He will require a fully fenced yard and a lot of exercise so he can mature into a healthy adult. Everest is a very popular boy with the volunteers. This boy has been with us since last summer. He was adopted out once but chased the cat and came back. 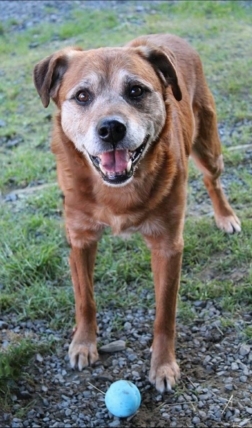 Hoss is a seven-year-old Lab/Shepherd mix with plenty of energy. He would spend his whole day playing fetch if he could. He’s a champ; he drops the ball at your feet and then sits until the next throw. Walks and runs are also high on his list of favorites. Hoss will need a home with a fenced yard and no cats. 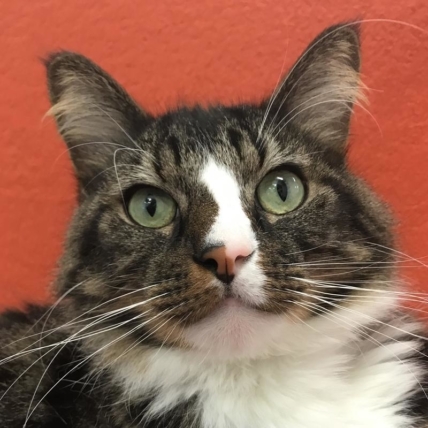 Gideon says he’s ready to be adopted by a human who needs lots of love and attention! He can even show them the way out! This five year old boy is a real sweetie according to volunteers in the know. 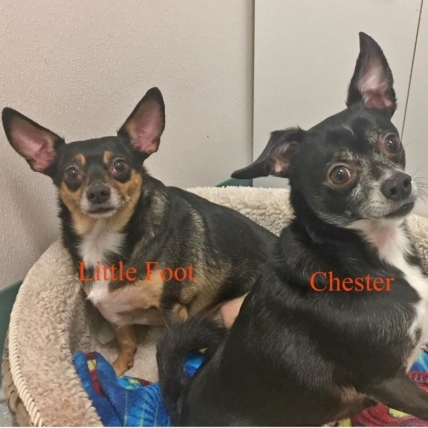 This bonded pair came in when their owner died. They are very shy and will need a quiet home without children. Both prefer men to women (their owner was male.) 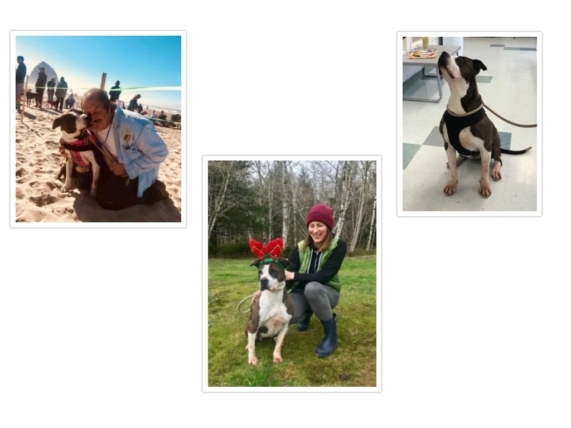 A patient adopter will be rewarded with two very loyal, loving dogs. 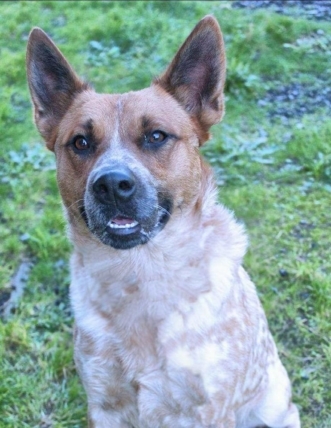 Isaac is a one year old high-energy Australian Cattle Dog who will do excellent in an active home. 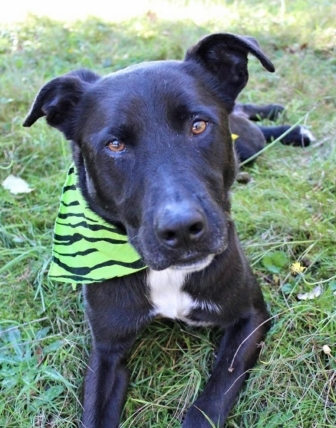 Isaac is very smart and a quick learner, but needs a dedicated owner who can help Isaac channel his energy and focus. Isaac enjoys long hikes and runs, and any active dog sport (we hear he’s becoming a champ at agility,) but will also happily snuggle with you at the end of a busy day. Since Isaac likes to live life at full speed, cats and other small critters are not very fond of him. He might do best as an only dog as he can be dog reactive, mostly because he doesn’t understand how to slow down and politely interact with other dogs. 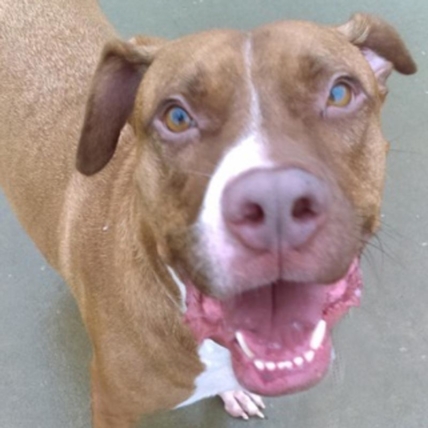 If you are looking for a hiking buddy or jogging partner, come meet Isaac! These two are a bonded pair and as sweet as they come. 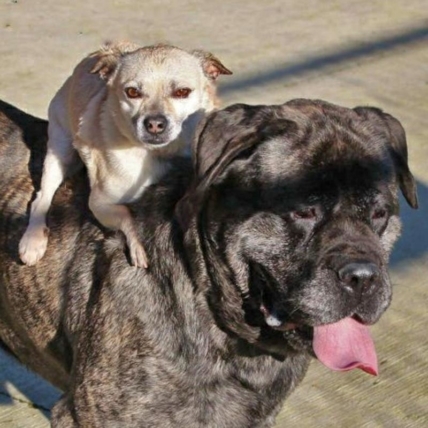 Bella is a senior Mastiff, very strong but also very gentle. Sean is a Chihuahua/Jack Russell mix. Both are friendly and happy, and definite volunteer favorites. They came in because their people are older and felt they could no longer give Bella and Sean all the exercise they need. The dogs love the walks and play time they get at the shelter and have bonded quickly with all the volunteers. Hermes is a quiet guy, but don’t underestimate him. He’s a senior cat whose life experiences have given him a keen eye for observation. Like a sentinel standing guard, he surveys his surroundings and picks up on everything going on around him. (When he isn’t napping, of course.) This gentleman enjoys human interaction, but isn’t comfortable with other felines. That may change as he gets used to the other cats, or it may not – either way is okay for this guy. He’ll be watching over the cat room until he finds a forever home to stand sentry over.